With so many tablets and smartphones becoming available, it is hard to know which device will best suit your needs. Though several devices currently on the market have garnered considerable hype, perhaps the one to wait for is T-Mobile’s release of the 2014 Edition of Samsung’s Galaxy Note 10.1. The new tablet has been one of the most talked about devices to approach the market. In this article, you will read the Review of T-Mobile's Samsung Galaxy Note 10.1 (2014 Edition) Tablet Specifications and Features details. The Galaxy Note 10.1 features a 10.1-inch 1080p display that offers more than four million pixels – approximately two million more than standard HDTV. Combine this with a pixel density of 299PPI and colors appear much brighter and images are rendered more lifelike and clear. With such clarity, you can enjoy streaming your favorite movies and television shows. The Galaxy Note 10.1 can also double as an e-reader for your books, magazines, and newspapers. Stay connected with all of your favorite apps such as Instagram, Pinterest, and Facebook. With the power and image quality of the device, there is no end to your entertainment possibilities. The Galaxy Note 10.1 comes equipped with an enhanced S Pen. This remarkable feature allows you to jot down phone numbers and contact info. Use the S Pen to compose text messages and Samsung’s handwriting-to-text engine automatically converts your notes to text. Using the S Pen is an easy and efficient way to navigate your favorite websites. 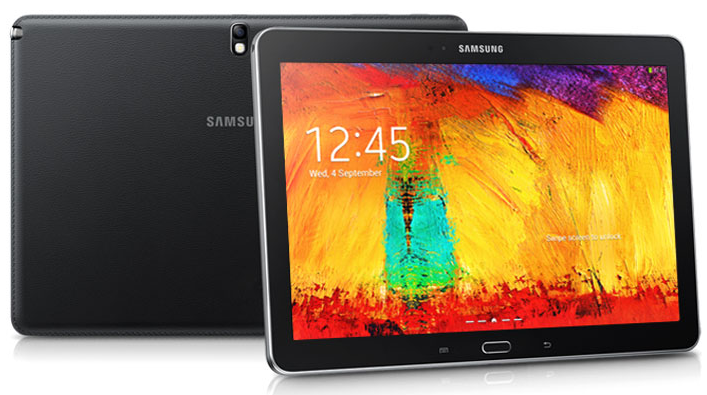 This Samsung tablet features an 8-megapixel 1080p main camera and 2-megapixel 720p front camera. The camera includes LED flash, auto-focus, and HD recording and playback. Use the camera to capture your favorite images or record video of your kids, pets, or anything your imagination can conjure. The battery for the Galaxy Note 10.1 provides up to 9 hours of Wi-Fi Internet use time, 10 hours of video play time, and 122 hours of music play time. The Galaxy Note 10.1 specs are equipped with 3GB of RAM and includes memory up to 32GB. It also features a 64GB micro-SD slot to supplement its available memory. The Galaxy Note 10.1 comes loaded with the Android 4.4.2 Operating System and Wi-Fi 802.11a/b/g/n/ac. Moreover, the tablet also allows the user to run and display two applications simultaneously. It also has the ability to drag and drop content from one application window to another. T-Mobile is in the process of adding an LTE version of the tablet to its network. This means that the device will be capable of global roaming in GSM/W-CDMA networks and 2100MHz LTE networks. In addition, the company is providing 200MB of free tablet data for life. T-Mobile has also included international data roaming and text in over 120 countries and has eliminated overage fees. Customers can sign up on T-Mobile to find out more about the Samsung Galaxy Note 10.1 and be notified when the device is available.